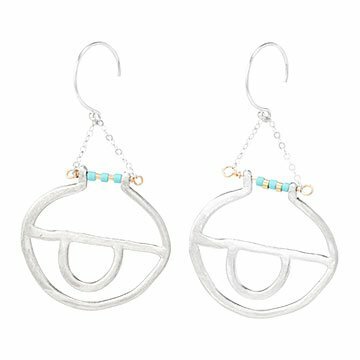 Christine Street's half-primitive, half-modern silver earrings add up to one elegant, versatile look. Christine Street's elegantly organic earrings are more than the sum of their parts. She sculpted their intriguing shape out of clay, giving the sterling silver an unusual, handmade look. Tiny turquoise and 14k fill beads, hanging like miniature abacus counters, add movement to the equation, multiplying its charm. Will they complement pretty much any style, from boho to modern? You can count on it. Handmade in Los Angeles, California.